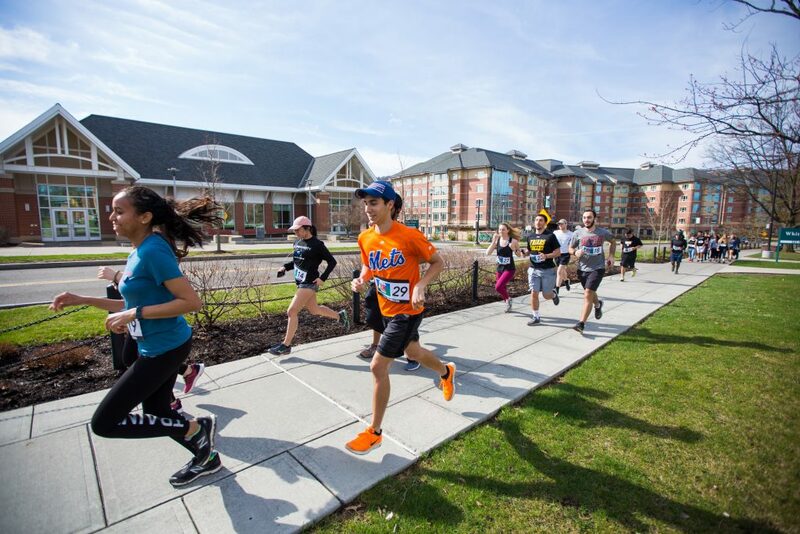 Katherine Scott/Pipe Dream Photographer Binghamton University’s chapter of She’s the First hosts its second-annual 5K to raise money for women to gain access to education in low-income countries. With the goal of increasing access to education for women in low-income countries, She’s the First held its second-annual 5K run on Saturday morning at Old Dickinson Field. She’s the First, a nonprofit organization that aims to sponsor girls in low-income countries so they receive an education, held the run in collaboration with Fit University, a health and wellness organization on campus, and Binghamton University’s chapter of Pretty Girls Sweat, a group that aims to unite women through fitness. Kyra Brunner, vice president of She’s the First and a senior majoring in sociology, said the event was first held last year, and following its success, She’s the First decided to hold it again. The funding raised by the participants, which totaled $310 from 40 walkers, runners and outside donations, will go toward providing education to women abroad and will help supply these women with other necessary materials, such as notebooks and writing utensils. Alyssa Lat, a marketer for Fit University and a junior majoring in psychology, said Fit University was excited to partner up with She’s the First for the 5K. Tim Garraffo, a sophomore majoring in philosophy, politics and law, came in first and was awarded a $25 gift card to Sake-Tumi, a Japanese restaurant in Downtown Binghamton. Garraffo said the event was enjoyable and deepened his knowledge of the issues surrounding women’s education. Michael Maceluch, a sophomore majoring in accounting, who came in second place and won a $10 gift card to Binghamton Hots, said he was happy to work out for a cause.